Right now, I'm enjoying the very early morning with ocean blanket cloud cover and coolness that my plants love so much. I don't know why it's called June Gloom, I find it refreshing and better than the heat that will soon follow. This has been a very fun and busy month beginning with a road trip to Santa Fe, New Mexico then to the Petrified Forest, and then to Sedona, AZ. While driving back to San Diego, we were caught in a wicked sand/wind storm! It was eery and beautiful just the same. Being a San Diegan, it's delightful when you see some seriously different weather! Weather in San Diego is kind of subtle and cheerful...cool, warm, hot and with ocean breeze or not, though the fog and early morning in May and June is wonderful. I saw some incredible art with numerous talented artists, way too many to mention. 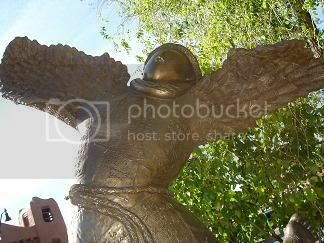 There were several artist that just touched my heart, one being David Pearson and his sculptures featuring angelic women, usually with birds with such a beautiful inner life expressed out. Go to http://www.carlislefa.com/ to check it out. I wanted to stay at the Patricia Carlisle gallery all day, especially in the garden with all those wonderful angel women sculptures, it was heavenly. One of my favorite experience was sitting in an outdoor French Cafe (owner gave me the low down Santa Fe + wants me to call her niece for possible fix up with my son!) having an early dinner, when a huge procession of people all carrying umbrellas started walking down the sidewalk in one long promenade. Some had big fancy banners and all were throwing rose petals on the ground! It went on for a good half an hour. I believe they were celebrating Saint Francis of Assisi from the St. Francis church, my favorite saint! Needless to say, work has been especially hectic and once again, I've signed up to many swaps that apparently are due at same time! I don't know how I'll be able to muster time to paint unless I give up sleeping, but I'm having fun and my drawing/painting abilities are pretty warmed up. 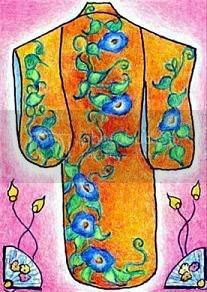 I just finished another card series - Kimonos, all in colored pencils. 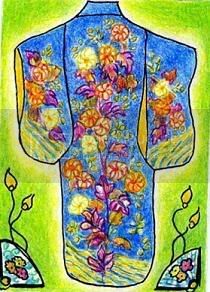 It's hard to do a kimono on such a small scale, and of course nothing beats the art of the real thing. 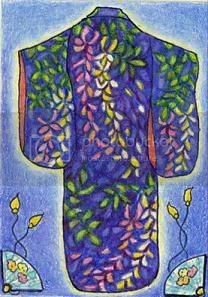 Originally, I wanted to do my mother's wedding day kimono, but then had another ideal of doing kimonos with my sisters and friends in mind. 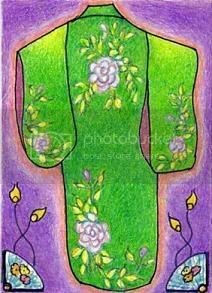 So, the Rose Kimono is for Kathy who is born in the month of June, the Morning Glory Kimono is for Patrie who is born in July and loves morning glories. The Wisteria is for all my girlfriends who like me, love all the hues of purple, and the Dahlia Kimono is for all friends. I can't wait to see the Itchiku Kobota Kimono exhibit when itcomes to SDMA in November. He designed the most breathtaking kimonos, hand dying the silks over and over. It's going to be a busy day today. A featured speaker on Thicht Nhat Han will be giving the sermon at this church I sometimes attend. I was lucky enough to see Thicht with my friend at my son's school early this year. Then it's off to the La Jolla Arts Festival! I need to get back early enough to do the shopping chores. I am slotted to make Strawberry shortcake for a work associate's birthday. Now that I'm back into art, I'm not so much into cooking especially with this hot summer...this is going to be a throw-it together cake! Next Friday morning, like at 2-3am, my family will head for Las Vegas to see my dad and his new home.